We’re still in November and the press rumour mill for January has already started to heat up. Why? It must be international week; traditionally a slow news week for respective club news with the main media focus else where. This presents the sorry situation of lesser media outlets suddenly finding they’re the ones who are having their stories ‘cut and paste’ and made headline news by various football websites, local press and the like, in the name of advertising clicks. In short, easy fodder for Media Muppets Watch. It is expected Zaha will be moved on in a January loan deal, with several top flight clubs linked with the player. Newcastle United, Everton and Palace are all believed to be interested but SportsDirect News has learned Villa are in pole position to agree a deal ahead of the winter window. United signed Zaha in a deal that could be worth up to £15 million to Palace, before immediately loaning him back to the south London club for the second half of last season. 1. When you walk into a SportsDirect sports store, the first thing that greets you is the smell of cheap plastic trainers and polyester sports goods. It’s kind of the smell that this article gives off. ‘Sports Direct News’ is a website set up to further the SportsDirect brand of Newcastle chairman Mike Ashley. Also, based the simple model of a lot of generic football websites, it’s there just to pump out every rumour story it can get it’s hands on or make up to gain advertising clicks. 2. As rumour stories go, there’s logic to it, so we won’t mark it too harshly. Villa could do with the option of a winger and Zaha is of the age that Lambert likes, and he has the talent to be of interest. But, the only evidence is a single sentence in the article by essentially a marketing website – ‘SportsDirect News has learned Villa are in pole position to agree a deal ahead of the winter window‘. That’s it? Learned from where? 3. SportsDirect News seemed to be the first to run this Zaha story. Then the likes of the Birmingham Mail and caughtoffside.com etc ran ‘cut and paste’ jobs acknowledging SportsDirect News as the source. So, that single sentence above was enough for them to run the story? No further investigation needed then? Well, congrats to SportsDirect, they may sell a few more plastic trainers due to the extra promotion that media outlets with zero standards have given them. MAN UNITED, Arsenal and Spurs are preparing to slug it out over Aston Villa ace Christian Benteke. The Premier League rivals all want the Belgium hitman in the new year and are ready to start the bidding at around £25million. But whether they find Villa in any mood to listen to offers in the middle of another testing campaign remains to be seen. Villa Park boss Paul Lambert, having persuaded Benteke, 22, to sign a new four-year deal in the summer, is definitely under no pressure to sell. There is no release clause either. And should the Midlands outfit refuse to budge in January, United, Arsenal and Spurs will be forced to look elsewhere for a striker – or come back again next summer. But right now Benteke remains the top target of the trio. United boss David Moyes is a big admirer of the 6ft 3ins forward, who cracked 23 goals in his first season in England. Moyes has made several personal checks on Benteke this term, including last weekend when the player failed to find the net in Villa’s 2-0 win over Cardiff City. 1. Yes, another wave of Benteke transfer stories. They’re basically running the SAME story every week and it’s getting to the point where Media Muppets is in danger of doing the same thing too! 2. If Mr Pratt had read over his second and third paragraphs, he might have thought, ‘Hang on a minute, there actually isn’t a story here’. I mean, ‘persuaded Benteke, 22, to sign a new four-year deal in the summer, is definitely under no pressure to sell. There is no release clause either.’ kind of suggests so. 3. We said last week when we posted this picture of David Moyes at Villa Park (top centre) for the Cardiff game on MOMS facebook and that we wouldn’t be surprised if the press thought, Moyes must be there to watch Benteke. Maybe he was also there to persuade Lambert to take Zaha on loan too?! 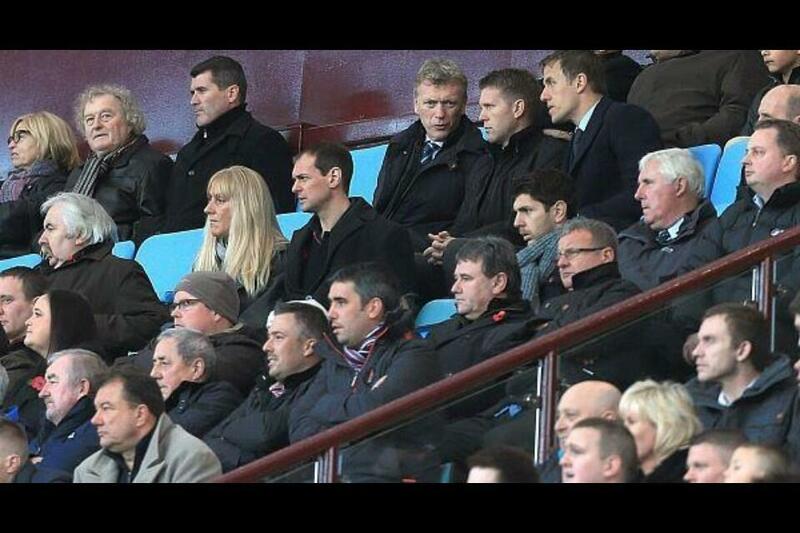 Why was Moyes really at Villa Park? Well, who are United’s next opponents? Cardiff away. Who else do United play in a few weeks time? Aston Villa at Villa Park. So basically, it was a perfect two-for-one scouting trip for the United manager. 4. Last time I checked, United had Robin van Persie and Wayne Rooney up front, and a decent back-up in Javier Hernández, who they’ve actually opened contract talks with. Do they really need Benteke? 5. As for Arsenal, it’s just Tony Cascarino and Mark Lawrenson that have said Arsenal should buy Benteke. Apparently, their views are important enough to spin a ton of pointless articles from (and cut and paste jobs by caughtoffside.com and co). We couldn’t even be bothered covering Cascarino and Lawro properly in Media Muppets. What Wenger says is surely more important than two washed-up pundits. 6. Enough already with this £25 million Benteke price tag nonsense. As we’ve said before, the Belgian striker has just signed a new four-year contract. Any price would be much more, unless the Villa board are a bunch of suckers. 7. Did caughtoffside.com cut and paste Mr Pratt’s Daily Star article? Of course they did! I think that you should up your Media Muppet score on the Zaha ‘story’ on the basis that Lambert’s desire to sign loan players seems to be somewhere between zero and zero – which is fine by me, I don’t see the point of loan players anyway! Strangely the Zaha one may actually be true. Given that Sports Direct News is owned by Mike Ashley, who also owns Newcastle (another team mentioned as being interested), it may be the case that MA has leaked the story himself inorder to raise the profile of SDN. I wouldn’t put it past him. That is a possibility, that’s why we said there was logic to it and gave it 7/10. As a story though, they could have given it more meat to warrant publishing it. At least dress it up a bit.